The man made Mogao Caves contain over 40,000 colorful wall art. If laid side by side, they would extend 30 kilometers (20 miles). 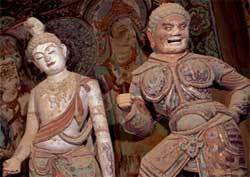 The Mogao Caves also contain thousands of painted statues (see photo) and scholarly scrolls. The Mogao cave art (mainly Buddha related) first appeared in the 4th century and continued, with some interruptions, over the next thousand years. For a long period, many of the Mogao Caves were sealed and forgotten. And, few people beyond the locals knew of the existence of the accessible caves. About one hundred years ago Western World museums and art dealers became aware of the artistic treasures. Soon, they and their Chinese agents began exporting many of the irreplaceable scrolls to the West. Fortunately, nearly all the wall drawings and painted statues were left behind. The wall paintings have retained much of their bright hues because of the dry desert climate.